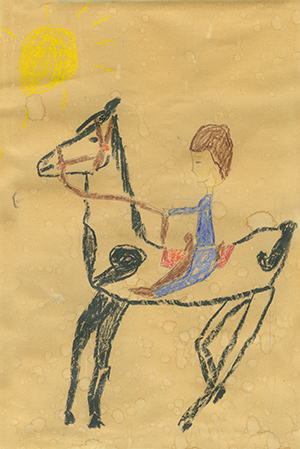 Margaret was around six years old when she created this wonderful drawing. Notice the selection of fine brown paper bag canvas she chose for long-lasting archival qualities. Utilizing the full color array of Crayons, Margaret creates an exciting image of a horseperson atop their trusty steed. The steed, posed to spring into action, offers a comfortable, safe ride, enveloping the horseperson in a saddle-lined nest in its back. Notice the scintillating colors employed to add cheer – a trate she still uses today. The rider appears to be holding the faithful pony from galloping off the page. So much action and excitement!